Neil Vorster, a Parkhurst, Johannesburg, resident, is going to cycle the 94.7 Cycle Challenge on 20th November 2011 on behalf of Children of Fire. He has got two friends to agree to cycle with him and is looking for seven more people to make the charity's first ever team to compete in this cycling event through Johannesburg. 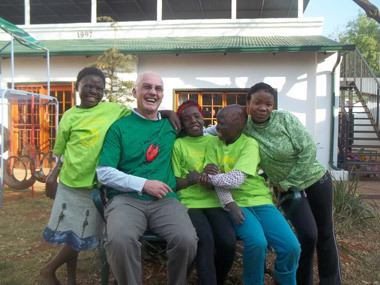 Neil visited the children on 15th September 2011 and is here seated with Jose (11), Karabo (11), Babalwa (11) and Boipelo (16) in the garden at 58 Auckland Avenue.